Lettie's Ocean is a bright turquoise color with a linear holo finish and a sprinkling of silver holographic microglitter. I may be in the minority, but my favorite part of this polish is the added holo microglitter. Anything that adds just a bit more dimension can really take a polish to the next level. The formula was a bit thick, but was by no means unmanageable. It didn't warrant busting out any thinner or anything. You're probably asking yourself, "Man, could she take any more pictures of this polish?" I get you, I really do. Duochromes are notoriously more difficult to photograph...especially when they're a bit more subtle. Miner's Gift is a blue/purple/gold multichrome polish with a bunch of holographic silver flakes. Again, Amy had me with the addition of the flakes. The shift is most apparent in low, indirect light which is basically the opposite of what you get with holo polishes. I was expecting to use 2 coats based on how dark it looks in the bottle, but I did a third for good measure. Again, it was ever-so-slightly thick for my taste, but that's always subjective, and I didn't really need any thinner. Multichromes are very on-trend, and I'm loving every moment of it. Get Miner's Gift if you're looking for something interesting with a bit of flair. Oh, did I fail to mention that this trio has a variety of finishes? Yes, Swaying Grayly dries to a matte finish which took me completely by surprise. And to be honest, I'm not sure if I like it better matte or shiny. I often opt for topcoat, but I think I'll stick to matte next time I wear it. Swaying Grayly is a matte silvery grey with tons of silver and gold flakes. It you look closely, you can see some flashes of holographic flakes as well. The first coat was a bit sheer, but it was fully opaque in 3 easy coats. You guys know my love for grey polishes, so it should come to no surprise that this is my favorite of the set. You probably need them all, but at least add this to your cart first. These colors are not limited edition and will become part of the core collection. Also, there's no need to have your trigger finger ready at exactly noon because the store will remain open and stocked (those of us at work-rejoice!). The shimmers and creme polishes will be for sale at $10, while the multichromes/holos will be $12. 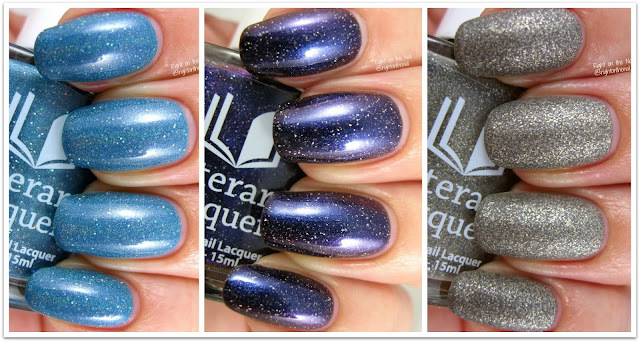 I'm not done with Literary Lacquers just yet; I have 3 colors to show you later this week, so check back soon. To learn more about Literary Lacquers, check out their website, Facebook Group, Facebook page, and Instagram. I love your outdoor shots of Miner's Gift! You really captured the shift and sparkle!